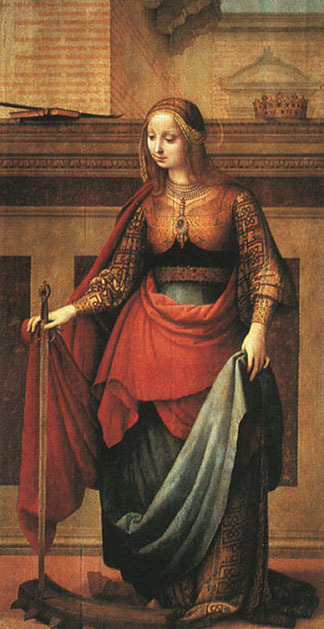 St Catherine of Alexandria, Patron Saint of Educators. I was a graduate law student, but the marvellous thing about studying in Korea is that you do not have to work in a bar or as a cleaner to supplement your living while studying; you can tutor, something which all students – including Korean students – do. I am a qualified ESL teacher (something I did just after graduating from my first degree) which means that I have an amazing fall-back in the fact that I am, inter alia, a real teacher. Teaching pays considerably more than bar work (and I don’t have the figure for the kind of bar work that pays really well), or any of the other truly terrible student jobs I have had in my life. I image that I will be using my qualifications in English Teaching for many years to come, and of course, the teaching skills are cross-transferable. If you can teach English to resistant, rebellious teenagers, you can teach law to people who actually want to learn it. I’m posting my “all-purpose” game and worksheet templates here for visiting students and teachers (many of you work in Korea) to download. They are “all-purpose” because they can be adapted for any target language, and any ability level. I have also included here some printable play-money for market, currency exchange and negotiation games. You assemble the bills or the coins by cutting a front and a back out together, and folding in half. Then you laminate for durability (trust me, you want to do this, kids tend to bend them). You can print these for class use but you can’t sell them or pass them off as your own work. The play money looks like the real thing (in order to get the students used to handling different currencies) but of course they are not the same size, colour, and they have been “altered” electronically. Laminate them, though, because if they find their way into your wallet on a dark night you’ll get a pretty angry taxi driver :D.
If you download a worksheet or game and use it, please write a note at the bottom of this page and tell me what you did with it and how the game went in class: that’s my “fee” if you like. These worksheets are good in East Asia where students are accustomed to dull repetition, chanting, and rote memorisation, and as a result switch their brains off in class. It’s a good primer for a discussion on experiential learning. Is he a person or a robot? (Long Version) [pdf]. Is he a person or a robot? (Short Version) [pdf]. I use mental maps a lot for vocabulary and concept building to prepare students for speaking, listening or reading. Below you can find a blank Mind Map and ones specifically for well known heros and superheros. Map of the World: Laminate several of these and use them for guessing games, nationalities and adjectives. Happy Face – Sad Face Cards: For use to vary the responses to questions from positive to negative. Assemble the Snake: Students assemble a sentence in the correct order. Blank Chinese Checkers Board: aim to get all their counters from one side of the board to the other. Your choice of target vocabulary. Finally, a word on how to create your own. All these teaching materials were created with Open Office – the English Version that I downloaded on my works computer and various PC Bangs in South Korea. It’s extremely intuative, totally free, and much better than MS Office. For an English-Speaking professional in a country where the computers – and their installed software – are in another language, this has been an indispensible tool. I especially like the “export as pdf” function in the file menu. They get the”Big Button” award for being an excellent product. OK, all the play money should be added now. Let me know if there are any problems. I’d love to print out the comic strips but the website won’t let me click on it. Please help. Sorry – MA Thesis due in. Check back on Tuesday and I should have uploaded everything by then. Hi, I homeschool in Australia, and have just printed off your Australian play money to start teaching my son the different notes. Thanks, and well done for Home Schooling! Thanks for these fun resources. I will use some with my primary school class. Hey, thanks for the Australian play money print out. I will be using it to help a refugee family get used to Australian currency. I have created my own coins (including 5c, 10c, 20c & 50c) and will use my daughters toy cash register to make a ‘play’ situation where they can practise paying for their shopping. Once again thank you for making this so much easier for me! Thanks! Used the play money for a pet shop during my placement. Thanks for the blank comic strips – brilliant idea! What a superstar. As teachers we are always seeking to pinch resources from others – but very few are as generous as yourself, putting your own work out there for others benefit. Many many thanks. Thanks for your comments. If you have worksheets or games you have made yourself and want to share, send it to me in .doc or .odt (or pdf) format at scottishboomerangSPAMBLOCK@gmail.com (take out the capitalised letters when you write) l’ll put it into PDF format and post it up here. Your $5 in the Australian Currency is incorrect. It actually has the Queen and Parliment house on it. Thanks for this, these resources were made a while ago and coinage does change over time. I’m no longer teaching children, but if you make your own $5 resources, why not send me a copy in MS Word format, I’ll whack it into a pdf file, and upload it here. i do family day care and have some preschool kids who love playing shops. the play money will be a great addition to our shop area. thanks. Thankyou for the play money. I’ve printed off the £10 to help teach my class decimals. We have plenty of coins in school, but alas no paper specimens. Thanks for sharing this resource. I am planning to use it in a game with my students who are completing some AOD units at tafe. Thanks so much for your comments. I will be putting up some new currencies shortly. Thanks very much! I’m going to use the Euro notes when I deliver an enterprise activity called Eurogateau in primary schools. Hi – I’m a fourth year Bed (ECE) students and I am about to ‘set up shop’ for my final practicum. Thanks for the resource – it was just what I was looking for.